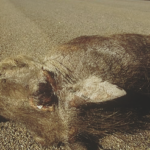 The 50-year-old Almaline Kauami passed away on the scene of a motor vehicle accident and eleven other sustained serious injuries after the vehicle they were all travelling in, hit a warthog and overturned. According to the commander of the Namibian Police’s Public Relations Division, Deputy Commissioner Hophni Hamufungu, the accident occurred at around 20:10 on Saturday evening on the road between Okakarara and Otjiwarongo. Deputy Commissioner Hophni Hamufungu said the vehicle had three adults and ten children on board when the incident occurred. Eleven of the 13 occupants sustained serious injuries and were transported by ambulance to the hospital at Okakarara where they were admitted for further medical care.